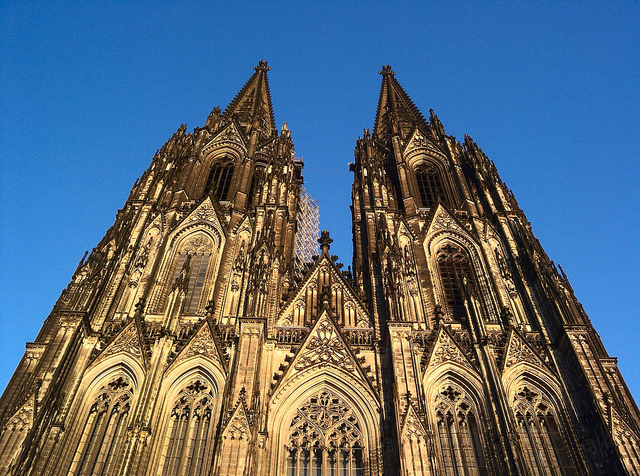 Introduction: The Cathedral of Cologne ranks among the most magnificent churches of Christianity. As the seat of one of the most important Roman Catholic archbishops, it is the spiritual center of the religious life of German Catholics. Its enormous size and the purity of its High Gothic method of construction make it famous around the world. Thus, it is not surprising that two to three million people visit it each year. They look up in amazement at the impressive, vertical architecture without realizing that the history of this powerful cathedral can be traced to earliest Christian times. Therefore, let us begin at the beginning. This short passage ushers in Anglophone visitors to Cologne cathedral via a booklet of fifty-odd pages providing concise but fairly comprehensive information on the history, artistry, and architecture of one of Europe’s best-known Gothic churches. In addition to its predictable praise of the historical and art historical attractions, the passage stresses the importance of Cologne cathedral as the see of an archbishop as well as the “center” of contemporary German Catholicism, and it sketches the apparently unbroken chain of spiritual significance of the church site since early Christian times. While the word “German” does make a short adjectival appearance in the passage, there is no further reference to the prominence of the cathedral for the history of Germany as a nation state. Because today cathedrals in most parts of Europe are mostly serving as spiritual sites and thus, as most observers believe, serve the same function as they did in their medieval past, the complex negotiations of the cathedral’s symbolism and signification between church and state authorities in former centuries are largely overlooked. Like the author of the Cologne cathedral guide, this essay should begin at the beginning, i.e., with the origins of the cathedral in Late Antiquity. During this period, when Christianity is succeeding in converting the majority of the population in western Europe to join its cause, the formerly open Roman villages, secure because of the Pax Romana, surround themselves with walls to be protected against invaders. It is inside these walled castra that the cathedral church and its numerous adjacent administrative buildings implant themselves. Consequently, when the Germanic tribes overrun the Roman Limes, the Christian administrative centers are in place and functioning, and for the triumphant invaders there seemed to be an intimate connection between the urban centers and the organized Christian faith. Bishops had made a point of imitating with their episcopal churches the civic buildings of the Roman era, particularly the basilicas. Quite often, they even installed themselves and their episcopal throne, the cathedra, in the former Praetorium of the Roman emperor’s local or regional representative. Those buildings were adapted to the necessities of liturgical celebrations, but retained in their architectural design the signature of authority, a semicircular apsis in the back of which the episcopal throne replaced the chair of the governor or procurator.